Favourite food? Cheese. Actually, I hate food to be honest. Favourite Book? Harry Potter and the Prisoner of Azkaban. Favourite Film? Harry Potter and the Goblet of Fire. Favourite Animal? Why? Owls as they are awesome and deliver post in the magical world! How did you find Gaia Online? A friend invited me over. What do you like the best about being on Gaia Online? The people. If you could have any special power, what would it be? Invisibility! Tell us something unique about yourself! Unique...? Isn't everybody unique in their own ways...? I really don't know. Lol. Gaia or not, whatever I feel like writing about will go here. I put up items here at random. I try to make them the lowest marketplace prices. Sometimes this may not be the case, so I will most likely enable bids then. I never put bid increments on any items, which makes everything fair hopefully. If you&#039;re looking for a specific item, PM me - I might have it. I do not give refunds, even for mistakes. Also, many people have sometimes requested the items I wear. If I decline, please stop pestering me. Most of my items were gifts and I do not wish to part with them. I offer other services like graphics, tekteks and bumping. If interested, please PM me. As a last note, I am collecting Titan&#039;s Legacies, Giftboxes, any junk or unwanted items and all coloured inks. 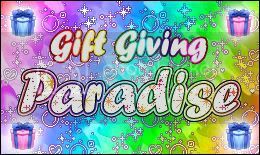 You have been invited to AB's Gift Giving Paradise! Want to draw my avatar? I'm 18 atm and I log onto Gaia yearly for the nostalgia. Today I felt like logging on and checking my PMs from like a decade ago. The first item I ever bought was from you, so I decided to check your profile out. Turns out you've been gone for a while now, but you're still here in the hearts of people who write to you, including mine. I never got to know you and never will, but I can tell you were a sweet and loving person. Thanks for making my childhood an amazing one, even if you had a minor part in it. Rest in peace. happy birthday love, always thinking of you. Always think of you around this time of year. Giving gifts and fulfilling wishes in your honor. You are missed! I still think about you from time to time. You were definitely one in a gazillion. Some users experience a glitch on my profile wish list: if you click an item on it, it will direct you to your own profile. To get around this, right-click on the item and open the link. Apart from items included in my wish list above and dream avatars below, I am thankful for any sort of fish given to me. They are one of my favourite animals and I love looking after them in Gaia. I also collect Titan's Legacies, Giftboxes, any sort of junk and all inks. Anybody can make me avatars! All I request is that the same hair, similar skin type and similar eyes are used unless you decide to use items to replace them (e.g. wigs, body dyes, etc.). For those who do not know my original hair style, it is called Girl's Bao Pink. My original eyes are called Girl's Round Eyes Brown and my original skin is called Human A Potion.